These Headbangers tagged themselves at in the #8th position of the top 10 longest world tour of all time in the earlier of the year 2016 based on their album Book of souls. Iron Maiden got the most brilliant album artworks or covers in the world of heavy metal band albums!! Eddie consists of hidden messages, mockery, and the complexity of human life as well!! At first, Eddie used as a mask by a student of arts, who created all the scary images n’ effects for the band as well on their concerts. Sometimes Eddie makes controversial issue n’ even made the band banned as well!! But still, that famous Eddie made them famous, Satanist, unique logo for their T-shirts as well!! Now let’s take a look to the Iron Maiden iron maiden songs and Iron Maiden albums in order. iron Maiden killers, their 2nd heavy metal studio album by the Maiden’s released in UK & US as well with their brand-new Lead guitarist Adrian Smith but their vocalist Paul Di’ Anno got kicked out because of being high on Alcohol n Cocaine as well!! BLAHHHHH!! Not only almost the entire album was written by the band leader n’ Bass player Steve Harris. They found themselves in the 12th position of the UK official album chart!! How cool is that huh?! 3rd heavy metal studio album and the first album of the mighty world-famous heavy metal vocalist Bruce Dickinson which led them to be the #1 on the UK top chart & platinum certification from the US!! That headbanging metal band album had highly commercial success but they faced some religious controversies especially in the US for their album cover n’ lyrics as well!! A 4th heavy metal studio album of the Iron Maiden & the first album of the current drummer Nicko Mcbrain came as a drummer and the previous one gets kicked out!! KHAKZ….. In the #3rd position in the UK top chart n’ 14th in the US Billboard 200!! 😀 The lyrics of that album contain jokes towards the critics of the Iron Maidens who claimed that they are Satanists!! Lolz, that was a satirical metal band album on a major point of view of the Iron Maiden!! Iron Maiden Powerslave, Re-released in 2002 the 5th heavy metal studio album of the band with their pioneer world famous song of all time The Rime of the ancient Mariner!! From the original poem of the Samuel Taylor Coleridge as their second longest track for 31+ years!! DAMN. Their first longest track came out in 2015 on their album Book of Souls! After releasing that album, the Iron Maiden’s Discography rolled on their way to magnificently successful 13th month’s long world tour in 1983. Named as the World piece tour!! This time, they were on the soil of US for the first time in their life. Not only that this famous album peaked up at the #1st n’ #2nd as well in the UK top chart & 21st in the US top chart!! How cool is that?! In this album, the lead vocalist, Bruce Dickinson recommended some acoustic lyrics to change the atmospheres but rest of the band rejected his idea n’ decided to continue with their heavy metal genre as well. Their 7th heavy metal studio album of that mind-blowing band, re-released in 2002 and their very first album of featuring with the keyboard with the essence of progressive Rock s as well and that essence is still continuing!! This album assured its position in the top of the UK chart. The cover art of the album considered as the weirdest one which came from Steve Harris’s concept & became the traditional symbol of the inspirations just like the mighty Iron Maiden!! For releasing that metal band album Harris converted his entire building as a studio!! This album is consisting of musical experimental like the use of power Balled Fast tempos, history of the Gulf War from a soldier’s first-person point of view Afraid to shoot strangers from an anti-war perspective!! The different issue on their lyrics Written by Steve Harris one of the main reasons for that he was going through his divorce n’ he depicted of the picture of it on his lyrics & even on that metal band album cover as well! As being on the flop list of their project that album still managed to dominate #8th position of the UK top chart n’ 147th of the Billboard 200 and that was just a shocking album for the Iron Maiden!! Ah Finally….. The 11th heavy metal band studio album of the band. The last album of the key vocalist Blaze Bayley and a flopped one as well. This album was basically based on their computer game for metalheads, Ed Hunter and took the artwork from their game as well!! Not only that they featured football world cup of 1998 because of their fans and played friendly football matches around Europe!! How cool is that?! They took the title of the album from a novel. This time, they had a world tour with this album on another hand that album paved the way of the #7th position of the UK album chart, 39th on the Billboard 200 and got a certificate of gold as well!! 13th studio album by the band. At first, released in Japan consist with their unique acoustic song Journeyman written by their Drummer Nicko Mcbrain!! 14th studio and the very first metal band album of Iron Maiden, which took it’s placed among the top- ten of the US Billboard charts at #9th & 4th on the UK official album chart. In that album, Bruce Dickinson came back like a damn good fighter from his cancerous tumor with consist of their longest song ever in their history of Iron Maiden Empire of the clouds. This metal band album got huge commercial success with lots of positive reviews from the fans r critics as well & ranked as #1 on the UK for the fifth time in their career!! best albums of 2015 #39th by the Guardian, 20 best heavy metal albums of the 2015 #1st by Loudwire, top 20 albums of 2015 #2nd by Ultimate Classic Rock., THAT’S MIND BLOWING!! Re-released in 2002 first live album of the band, it had a DVD of it in 2008 after it’s release it had positive responses from the audience it appeared the full name of their Mascot Eddie as Edward T H.
That highly rated album got high- quality visual effects from the Long Beach shows, lighting n’ productions as well from the World Slavery tour. Another heavy metal band lives album which consists songs of several live shows of the band n’ from a live Radio broadcast as well. The extended part of Eddie’s Archive box recorded by British broadcasting corporation BBC 1979-1988. 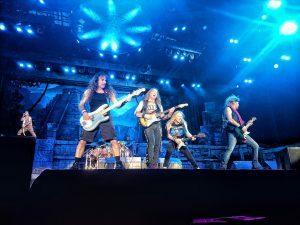 That heavy metal live album released based on their 20 years of their creations in the meantime of the Beast on the Road concerts tour & Number of the Beast. That metal band album was also a part of the set of Eddie’s archive box in their collection as well. their famous track like 666 Iron Maiden the number of the Beast became really popular for its mind-blowing music video!! Released its DVD as an Iron Maiden’s Discography in 2004 as the History of Iron Maiden (Part 1) their early they. But according to the band’s point of view, they were not satisfied enough of the visual quality because of the excessive lighting!! Their position at #1st in UK video charts, #22nd on the UK official albums chart, #14th in the US Billboard charts as well!! 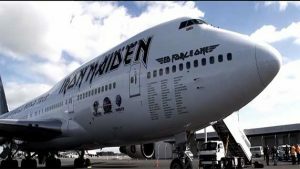 Named Ed force one came from their name of the metal head Mascot Eddie another documentary with HD visual quality from North America, based on their concerts of the somewhere back in time world tour. 50+ metalheads are still being able to rock the entire world. Classic Rock ranked them 8/10, Billboard 200 as #80th, UK official’s album chart at #19th!! and got several Gold & Platinum certifications as well!! And rocked on their position at #6th of the US Billboard chart & #2nd on the UK music video charts and got gold certified from Canada and the & US as a metal band. Back in the village, total eclipse, only the good die young, Flash of the Blade failed to get much more popularizes what they deserved!! According to the metal hammer which considers as their bad luck…. So many genres come & goes but this legendary headbanging metal band still managed to headbang out there with millions of its fans around the globe. Paul Mario Day, Terry Wapram and Dave Sullivan had a chat with the Bassist, what reminds them of the glorious rise of Iron Maiden!! The band still plays two of his tracks like the X Factor and, Maiden of his age!! Maidens don’t even forget their EX-Fellows, it doesn’t really matter what an iconic figure they are today! On the other hand, Steve, who doesn’t consider himself as a damn good Bass guitarist but love to introduce himself as a good lyricist!! He also believes that the proposal of their drummer and the keyboardist of Deep Purple Jon Lord, that we should so an Orchestra concert, I don’t think that will help too! !